Lutheran Schools are the oldest private educational institutions--as well some of the most successful--in the United States. It was in the late 1940s in Houston when visionary leaders from 12 churches organized the Lutheran Education Association of Houston (LEAH) and purchased land at the end of an incomplete Gulf Freeway to build a high school.A 12-member board of directors was elected to govern the single Lutheran High School, the first Lutheran high school in Houston. By the 1950s it was determined that another location would someday be needed as Houston grew. 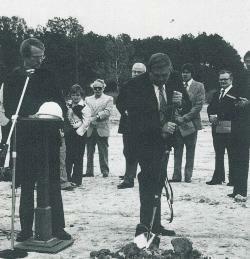 Land was purchased on the north side of town and on December 2, 1979, Reverend Hobart Meyer conducted the ground-breaking ceremony for Lutheran High North (LHN). 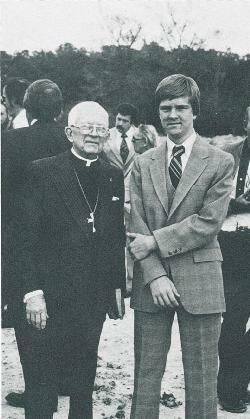 It was not long after this ceremony that school began on October 1, 1980 with freshmen and sophomore classes, and LHN began to develop Christian leaders for tomorrow's world. Staffed with eleven individuals dedicated to Lutheran education on the secondary level, the school grew. Many have served on the staff of LHN, and two of the original eleven remain and continue to guide LHN toward the future. In the spring of 1983, the first graduating class of Lutheran High North embarked on its future. One year after the opening of Lutheran High North, the original campus for Lutheran High School was moved to South Loop 610 and named Lutheran High South. The South campus served the Lutheran congregations on the south side of Houston and in 1989 added a middle school to the existing high school program. In 1994 it was determined that the South campus could no longer sustain itself in its present location and land was purchased at the Gulf Freeway and Dixie Farm Road. Classes were moved to that new location in 1998 with the completion of the new buildings. One year later an elementary school was added making it a complete PreK – 12 school which generated another name change to Lutheran South Academy. Many of our students on both campuses are involved in sports, musicals, bands and choirs. Three and four letter athletes who sing in choir are not hard to find. Opportunities to lead can be found in many areas and are encouraged. Many graduates of LSA and LHN have achieved high levels of success attending colleges like MIT, Columbia University, Texas A&M, The University of Texas, Rice University, and the Air Force, Naval and West Point Academies. Some have become engineers, teachers, lawyers, doctors, pastors and business owners. Throughout their existence LHN and LSA have continued to stand firm in the school's commitment to God's Word. In 2002 the Lutheran Education Association of Houston expanded its reach by purchasing land in the Katy area in far west Houston. This land became the third campus of LEAH in 2008 with the establishment of Westlake Preparatory Lutheran Academy. Westlake is currently an elementary and middle school with a high school to follow as it grows. Preparing for the future while cherishing its past, applauding the achievements of today and embracing our commitment to developing future Christian leaders of tomorrow's world, LEAH Schools stand strong in its tradition of providing quality academics and meaningful ministry to students. It is our hope that you too can become a part of this great tradition.